Deep amber color. Rich entry of caramel, burnt brown sugar and hints of karite butter, subtly giving way to a coppery, mocha-like, and slightly mellow finish. This product really screams Tiki with its spirituous edge and dark color and is a very welcome and versatile rum that challenges your palate. Really lending itself to tropical mixology, After Dark Rum is a product of extraordinary quality, scope, and character. As more consumers discover the nuances of fine rums they may also decide that overproof rum is once again having its moment in the sun. Technically, overproof rum is rum in any style that is over 40% ABV or 80 Proof. However, most overproof rums nowadays are bottled in the range of 150-151 Proof (75-75.5% ABV). While Tiki has traditionally called for rums by name (most notably, Lemon Hart 151) much of the industry’s other high-octane counterparts haven’t had as much attention. However, flash forward 8 years and that’s suddenly changing. Thanks to the craft cocktail revival, overproof spirits are once again back in vogue. In fact, many new bars are springing up across the country with names like ‘Navy Strength’ or ‘Overproof’ for good measure. Until Lemon Hart’s much-anticipated reformulation last year, Tiki’s high-octane void was initially filled by Ed Hamilton’s excellent Hamilton 151 blend – ironically, almost universally agreed upon as being much better that the current Lemon Hart 151 formulation, and as such, the gold standard 151-proof Tiki mixing rum. 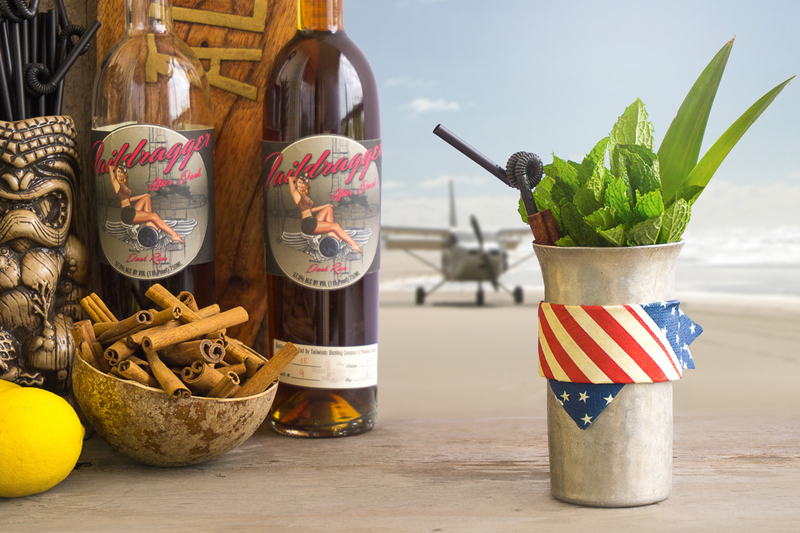 Taildragger’s beautifully-hued overproof After Dark Rum has deep roots in U.S. aviation. Then last year, Plantation’s much-hyped O.F.T.D. (Old Fashioned Traditional Dark) overproof rum burst onto the scene. While all these rums project an unprecedented payload of flavor, they can also be tricky to work with. Indeed, since high-octane rum brings more flavor, a skilled hand is required when mixing. 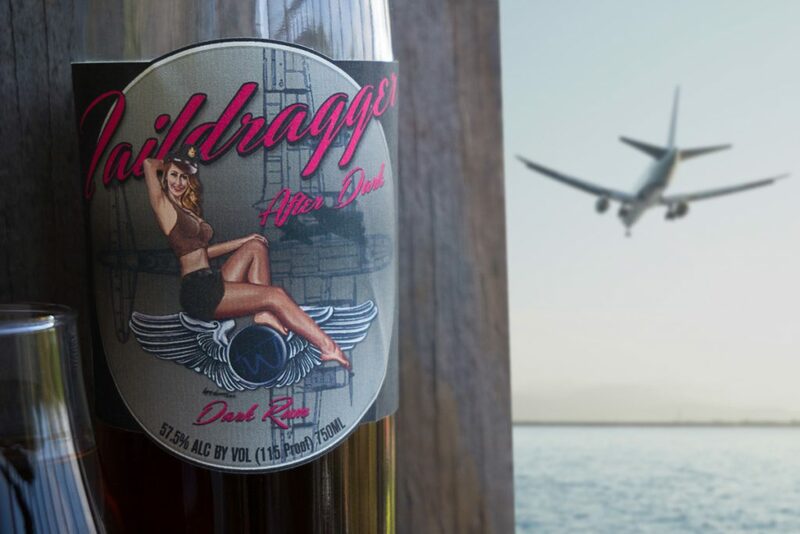 We thought the dark overproof rum category couldn’t get any better – that is, until we discovered a decadently delicious and potent rum hailing from Illinois called Taildragger After Dark Rum. 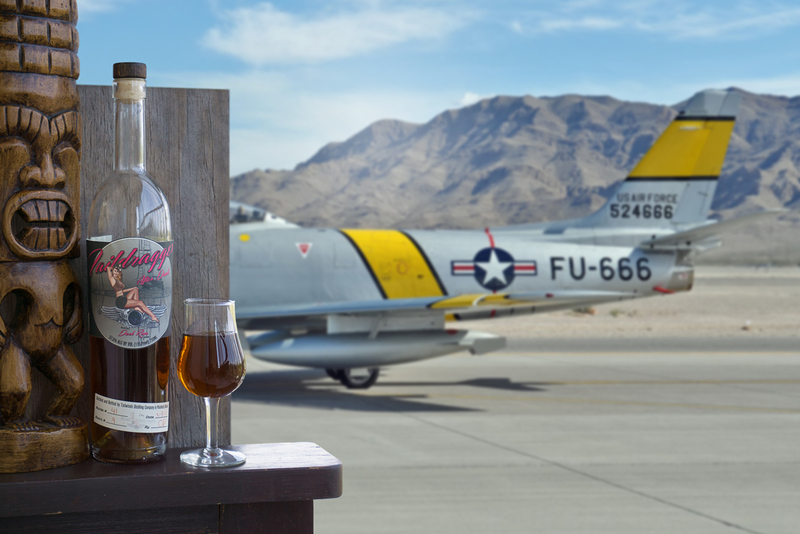 Taildragger After Dark Rum is produced by Tailwinds Distilling in Plainfield, IL and follows a very strict and craft-worthy batch distilling process from the Beall family who have a very strong tradition in aviation. Tailwinds’ vintage style aircraft nose art logo from renowned Virginia-based aviation artist Gary Velasco. After Dark Rum stands apart from other dark overproof rums in that it does not contain any added color or additional sugar; with the molasses being added to the rum there is typically a sugar obscurantism of 5-10 proof points, however, no sugar is added beyond that. The rum itself starts off life as a simple enough white rum before it is briefly aged in new French oak barrels which are charred to a No.4 (also known as the “alligator char”). While the barrel is charring, Louisiana molasses is added to the barrel walls, which instantly caramelizes, giving the rum most of its beautiful color and rich mocha notes. Tailwinds Distilling uses batch distilling on a hybrid pot and column still located at their Plainfield, IL distillery. 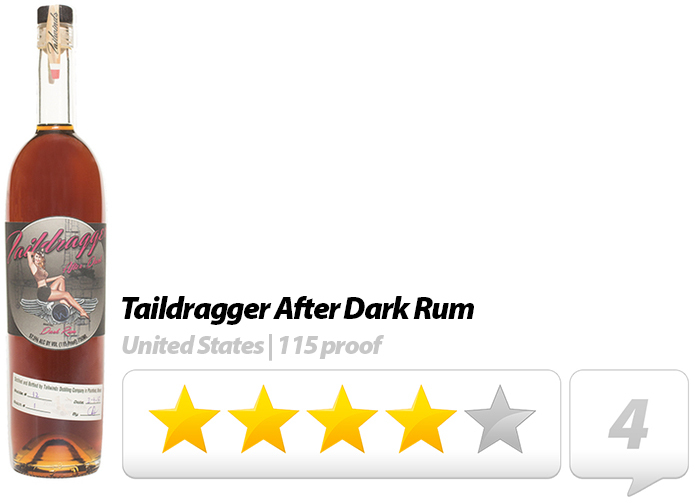 Taildragger’s After Dark Rum boasts a surprisingly palatable 115 Proof (57.5% ABV) payload. This overproof darling from The Prairie State delivers a robust payload of 57.5% alcohol (115 proof) that’s unexpectedly rich and smooth. While there is a slightly spirituous start to the rum, it soon mellows out with a very slow and palatable burn when taken neat. With serious notes of caramel, along with oak, spice, and molasses, the aroma is sweet, slightly fruity, and distinctively mocha-like. Hints of maple syrup from signals of burnt caramel permeate with a finish that’s sweet and lingering. 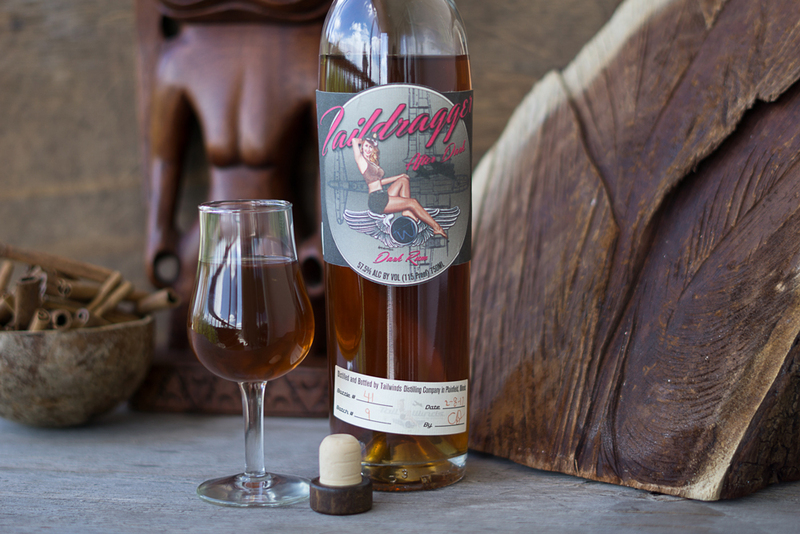 Taildragger After Dark Rum starts off as a 115 proof white rum and is then aged in new French oak. After Dark Rum is unique in that it is incredibly versatile in nature for an overproof rum – primarily intended to be a finishing element of tropical mixology, it also serves as a great chilled shot to get the party started, or, depending on your mood, proves to be something quite worthy of being contemplated in a snifter. In fact, we enjoyed this product just as much neat as we did in a classic Daiquiri. Don’t be surprised if you see this excellent dark overproof rum cropping up at your local Tiki bar in the near future. The one-two punch this rum offers makes it the ultimate ingredient that will effortlessly allow your tropical drinks to be fully expressed. We recommend it for use in Tiki cocktails, punches, warm winter grogs, a Mai-Tai, an Old Fashioned etc. We are grateful that companies like Tailwinds Distilling are helping shape the American rum industry by bringing back the lost art of craft distilling with superb products like After Dark Rum. If you enjoy fine rum, you will love After Dark Rum. Even if you do not ordinarily choose overproof rum, After Dark Rum will show you just how good a high-octane rum can be. Drunken Tiki’s Test-Flight cocktail featuring Tiki’s classic flared metal swizzle cup. 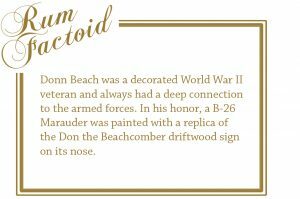 According to Tiki expert and mixologist Jim “Hurricane” Hayward, Tiki bar pioneer Don the Beachcomber’s Test Pilot cocktail was one of the most copied drinks during the mid-century heyday of Polynesian cocktails. “It morphed into the Ace Pilot, Space Pilot, and Astronaut, among others. At the Mai-Kai, it became the Jet Pilot,” writes Hayward. So in keeping with Tiki tradition and as a tribute to After Dark’s aviation background, Drunken Tiki has come up with their own classic, the Test-Flight. Method: Flash-blend with 1 cup of crushed ice for 3-5 seconds. Add additional ice if needed. Garnish with multiple fresh mint sprigs, cinnamon stick, and pineapple leaves. Pour unstrained into a flared metal swizzle cup. Expect a spirituous takeoff, opening up to a mellow and rich middle, and then slowly giving way to a spicy but smooth landing. The finish lingers for quite some time, becoming slightly floral with a touch of maple-guava. NOTE: Don’s Spices #4 (cinnamon simple syrup). We wholeheartedly recommend you use Finest Call orgeat, Drunken Tiki’s go-to orgeat, and try to stick with Goya for the guava nectar. Try to use a quality, Grade A maple syrup, and use Sandeman Tawny Port (less sweet) if possible. A good unaged, white rum will suffice. The key here is to not take anything away from the distinctive and full-bodied caramel profile of the After Dark Rum.